As a part of its multi-dimensional approach designed to address the whole person – body, mind and spirit – Mercy Multiplied often invites guest speakers to teach the Mercy residents at its four U.S. homes. Frequent visitor to the St. Louis Mercy home is Bert VanderMark. 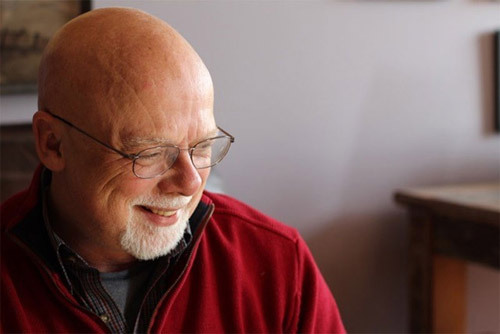 Bert has been teaching art for decades and now uses it as a platform to encourage people of all ages to explore their creativity while deepening their understanding of God’s love. Bert has extensive teaching experience in graphic design and illustration. He is deeply invested in Mercy Multiplied and regularly leads Visual Parables courses for the St. Louis residents. Visual Parables is a ministry of Artists in Christian Testimony International (ACT). Read our recent Q & A with Bert below. Can you share a little bit about yourself, passions and vocation? In studying art at the Royal Academy of Fine Arts, my introduction to art was immediately linked with fellowship, unconditional companionship, shared experiences, and love. After graduating from Washington State University’s graduate program, I was an art teacher and faculty member at a variety of colleges and taught for almost 18 years. I believe loving communication of the Gospel in the world today requires Christians to think beyond words on a page and preached sermons. Arts in ministry is using pictures based on biblical truth, for the purpose of encouragement, teaching, and bringing glory to God. Pictures can be a believer’s way of worship toward God, of sharing testimony with other people, and memorializing what God has done. Could you share with us a bit about your time spent volunteering at the St. Louis Mercy home? My purpose is not to teach art-as-skill, nor to share art in a way that creates self-centered perspectives through the art process. My focus at Mercy has been art-as-ministry—celebrating the truth, transformation, and healing that the women experience as followers of Jesus Christ. My focus when I’m at Mercy is to present the possibility of a new identity in Christ. How has God led you to use your platform to expand His kingdom? Arts Education – Equip brothers and sisters in Christ to understand and embrace the language of visual communication in the context of life and faith. Spiritual Formation – Network and mentor the next generation of artists in an authentic, caring Christian community. Cultural Redemption – Faithfully participate and engage in the work of redemption and restoration, using visual artistic communication as a witness to the surrounding culture. The work of Visual Parables came out of this desire to see people cared for through the Bible and through visual arts portraying Truth from the Bible. How did you first come to know Mercy? Eight years ago Mercy staff invited me to help residents make visual portraits of God’s grace. The paintings were displayed at a fundraising event in St. Louis. Supporters of Mercy we blessed to receive visual encouragements and testimonies. How often do you teach at the St. Louis home? What types of activities do you do with the residents? I have been scheduled to teach on Biblical Truth once or twice each month. Most recently I taught on Romans 12. I normally teach for about 30 minutes, then the residents paint and either reflect on the teaching or something else the Lord has been revealing to them during the week. Paintings for myself. These are memorials, reminders of what God is teaching or of His healing. Paintings for others. These paintings are meant to teach others about God. Paintings donated to Mercy. These works are distributed to donors as a thank-you for supporting Mercy Multiplied. What is the most rewarding part of working with Mercy residents? I love seeing creativity redeemed to portray biblical truth, powerful testimonies and renewed confidence in Him. 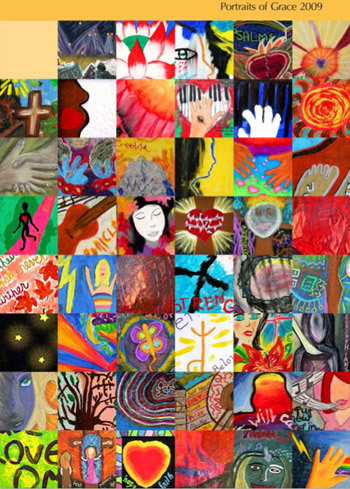 The paintings the women create are “progressive revelation.” That is, they represent snapshots of growth in Christ, as they learn to follow Him. Mercy Mulitplied is so thankful for Bert’s commitment to facilitate healing and creativity over the years. If you have a gift, vocation or talent you would like to share, click here to learn more about volunteer opportunities at Mercy Multiplied.